Shift interview Ed Rooksby on the ascendent "blue labour" faction which currently has the ear of Ed Milliband and the Labour leadership. We don’t usually cover party-political issues in Shift Magazine, but in the context of growing working class struggle under the Tory austerity drive we are interested in the latest move by the Labour Party to reconnect with working class and community concerns. Only that this move comes under the heading ‘Blue Labour’. Could you briefly tell us what Blue Labour is, where the idea has come from and what impact it is having? Blue Labour is an increasingly influential faction within the Labour Party which is seeking to reorient and rearticulate the party’s ideological political position - to provide a cohesive, vote-winning ‘big idea’ for the party under Ed Miliband. It’s an attempt to reshape the post-New Labour ideological landscape of labourism in such a way that, the Blue Labour faction hope, will help the party reconnect with the large swathes of the working class electorate which have steadily drifted away from Labour. When I say ‘faction’, however, it’s important to note that - as yet - Blue Labour seems to have very little grassroots support amongst the party’s membership - it’s very much an elite movement of Labour-affiliated academics (who should know better) and a few figures from the party hierarchy such as James Purnell and John Cruddas. There’s some irony here in that one of Blue Labour’s claims is that Labour should move away from the centralised top-down model of party organisation associated with post-war Social Democracy and become much more bottom up - and yet this is very much an elite driven attempt to reshape the party’s narrative and positioning. The doctrine’s main driver is the academic, Maurice Glasman – now Lord Glasman. He’s a close friend and advisor to the Labour Party leader and indeed it was Ed Miliband who offered him his peerage. So Blue Labour really does have the ear of the leadership right now. So is it a return to more traditional Labour values? The Blue Labour approach is founded on a simple historical narrative from which its prescriptions flow. The basic story is that important strands of thinking and forms of political organisation that used to animate the British labour movement were lost after 1945 and need to be rediscovered. In a sense the party needs to go back to its historical roots. Blue Labour want the party to return to 19th century traditions of bottom-up, pluralist and democratic working class based community organising – mutuals, co-ops, friendly societies and so on. These traditions, it claims, were lost as the post-war party turned increasingly to centralised, bureaucratic, paternalist and statist methods – the policies and practices we associate with post-war social democracy. They argue that Labour also needs to reconnect with what it claims are traditional labour movement values – community, solidarity and reciprocity for example. Few on the left would have much of a problem with those values. But Blue Labour figures also argue that the working class is fundamentally conservative. This is where the problems begin. They argue that for a fundamentally conservative working class an ethics of community and solidarity implies a defence of traditional institutions and identities such as the family, patriotism and the nation, faith and the work ethic. The Blue Labour approach is often summarised with the slogan; ‘faith, family and flag’. They also argue – and this is where it gets ugly – that defence of traditional working class community values and identities specifically implies by definition a defence of British ‘white working class’ traditions and identities. They argue that ‘mass immigration’ and ‘multiculturalism’ has been hugely destructive in terms of community cohesion and so must be resisted. This, I think, is a very dangerous message – and it’s very troubling that this sort of thinking is, apparently, so influential within the party at the moment. We could, quite legitimately it seems to me, reword the Blue Labour slogan as ‘faith, family and dog-whistle politics’. Then can we understand the Blue Labour programme as an attempt to shed New Labour’s neoliberal image? This is quite an interesting question. It’s pretty clear that Blue Labour is, in many ways, an explicit rejection of New Labour and of neo-liberalism. Glasman is very critical of New Labour and its embrace of free market fundamentalism. He even criticises capitalism itself from time to time. However, as Steve Akehurst [on compassonline.org.uk] recently argued, we should be rather sceptical about the intensity of Blue Labour’s ostensible hostility to neoliberalism. You just have to note the presence for example of the arch-Blairite James Purnell amongst the Blue Labour movers and shakers. He’s not exactly known as an ‘Old-Labour’ socialist. Indeed, one of the things that is probably very attractive to Blairites about the Blue Labour message is its anti-state message. This message can be understood and articulated in several different ways. You could understand it – and this is the way it’s being pushed by Glasman – in broadly left-wing terms. Of course, there’s always been a very strong tradition of anti-statism on the left amongst anarchists, revolutionary socialists, Marxists and so on. But these clearly aren’t the sort of political traditions in which Blue Labour is seeking to orient the party! We have to see the message that Blue Labour is pushing in the context of the social democratic tradition which has always been best understood as a tradition which seeks to manage capitalism rather than challenge it. In this context I think it’s very difficult to see anything particularly positive in Blue Labour’s anti-statist noises. This anti-statism on the part of Blue Labour in the context of managing capitalism on capital’s terms (how does social democracy do anything else?) would, in my view, entail, in practice, the rolling back of welfare. We have to see all of this too in the context of economic crisis and austerity politics – the Blue Labour doctrine provides great ideological cover for an assault on public spending and welfare in the guise of a return to ‘authentic socialist values’. This has to be one of the reasons why Blairites like Purnell are so interested in it. This doesn’t sound all too different from the Conservative’s Big Society idea. Are Labour picking up on this? Yes, absolutely. I think it’s pretty clear that the people behind Blue Labour see the Tories as having stolen a march on them with the Big Society idea. One of the major proponents of Blue Labour, for example, Dr Marc Stears, has been quite clear that he sees the Big Society doctrine as a ’spur to action’ for Labour and that, in his opinion, the left have ‘a lot to learn’ from it. So, in fact, one way of trying to grasp what Blue Labour is doing is to see them as trying to seize for the Labour party the ideological ground currently occupied by ‘Red Tories’ and other major proponents of the Big Society. One very interesting aspect of this is that Stears seems to see the ideas bound up with the Big Society - community engagement, voluntary and charitable provision of certain services, scepticism towards the ‘big state’ and so on - as ‘transcending’ the left/right divide. This is a trope of centre-left thought that keeps cropping up again and again - the idea that the left/right division is, in some ways at least, old hat, outdated or irrelevant. This was one of the major ideas that animated ‘the Third Way’, of course, which was the ideological narrative developed by theorists (most notably Anthony Giddens) in the mid to late 1990s to help steer the Labour party towards what became known later as Blairism. But you can also see this sort of idea in what centre-left intellectuals like Tony Crosland were arguing in the 1950s and 60s, too. It keeps re-emerging. It can be explained partly in terms of the party’s obsession with occupying the (fabled) ‘centre-ground’ - ‘triangulation’ and ‘big tent’ politics and so on. This is the self-fulfilling prophecy on which social democratic thought is pretty much founded - the idea that it’s impossible and politically suicidal to attempt to reshape the ideological terrain radically or to drag the locus of the political ‘centre’ very far to the left. 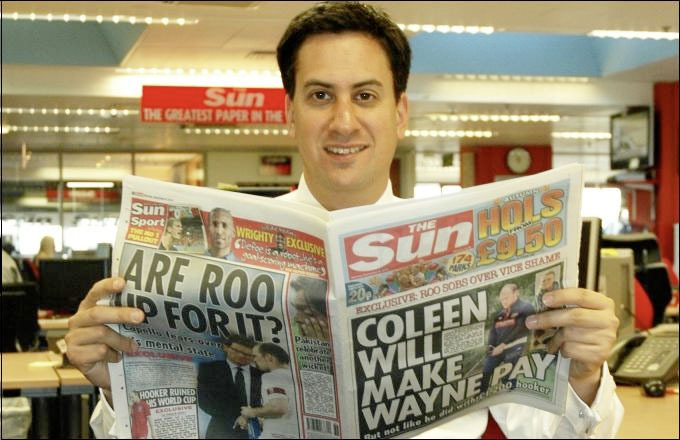 It is almost as if Labour lacks the courage to confront the typical tabloid views of the ‘white working class’. The political theorist Colin Hay makes a very useful differentiation between what he calls ‘preference accommodation strategies’ (shaping your policies to appeal to apparently pre-existing beliefs and prejudices on the part of the electorate) and ‘preference shaping strategies’ (seeking to intervene in political discourse in such a way that alters the ideological landscape). Hay applied this to New Labour, arguing that they almost unfailingly chose the former strategy. Blue Labour are, if anything, (for all their talk about ‘radicalism’) even more committed to a ‘preference accommodation strategy’ than Blair was. The thing is, though, that I think the constituency whose pre-formed preferences they are seeking to accommodate - the ‘Blue working class’ - is very largely a myth. Blue Labourites talk a lot about how politics has been far too dominated by a ‘liberal metropolitan elite’ (an idea and a terminology plucked straight out of a Richard Littlejohn column by the way) and how it has lost touch with ordinary working people. But their view of ‘ordinary working people’ is, in my view, pretty far off the mark in many respects. Indeed, if there’s an out of touch ‘metropolitan elite’ anywhere here it’s probably the Blue Labour clique themselves peddling a rather fantastical view of a ‘conservative working class’ playing happy families, going to church on Sundays, saluting the flag and getting all teary-eyed about the royal wedding. It’s as if their view of the working class is based on what they’ve watched in a 1950s Ealing comedy. Blue Labour supporters have asked “Where is Labour in the fight for an England which belongs to the English just as they belong to the land?” (Jon Cruddas and Jonathan Rutherford). Maurice Glasman even argued that Labour should “involve those people who support the EDL within the party”. This sounds much more like some see it as a matter of ‘if we can’t beat the BNP, let’s become the BNP’? Yes, this is the really ugly part of the Blue Labour approach. The ‘preference accommodation strategy’ they employ isn’t just restricted to a process of accommodation to conservative ideas and policies - it’s also quite prepared to flirt with racism and far-right politics. I never really expect to be much impressed by centre-left thinking - but this is really shocking stuff. It’s particularly disappointing to see someone like John Cruddas (who has an admirable record of anti-fascism) promoting this sort of stuff. Let’s be clear what Blue Labour are saying. They are claiming that the working class is somehow naturally and inevitably anti-immigration and pre-disposed towards far-right views. This is what they are seeking to accommodate. Their way of fighting the BNP and the EDL is not to take their views head on and to argue the case for leftist, anti-fascist and anti-racist ideas. It’s not to stand up for and to defend immigrant and ethnic minority communities. It’s to make major concessions to racist prejudice and suspicion. This is a real betrayal of labour movement traditions - for all Blue Labour’s talk of being true to fundamental labour movement values. It’s very dangerous. Even as a miserable strategy of seeking to undercut support for the BNP and the EDL by dressing up in some of their clothes it’s one that won’t succeed. It will only help to further legitimise the views of organisations such as the EDL and it risks creating the political conditions in which far-right groups enter into the political mainstream. If ideas associated with the far right are brought into mainstream political discourse and articulated by mainstream political parties, what’s to stop far right groups themselves capitalising on this? In Shift Magazine we have featured several articles that have warned of a simplistic opposition to finance capitalism, especially in counter-globalisation movements. Now in the Blue Labour rhetoric we also find a strong attack on finance. It is somehow assumed that the finance sector should serve the ‘real’, productive national economy. While this distinction between speculation and production is characteristic of the far right, could this serve for Labour as a nationalistic ‘Third Position’? I’d say it was characteristic of right wing populism rather than of the far right as such. Furthermore it’s not a position that is held exclusively by the right either. I’d be highly uncomfortable with any argument that implies that Blue Labour is a far right movement, or even a potentially far right movement - it isn’t. It’s important to say that I certainly don’t think that anyone involved in the Blue Labour faction is racist and it would be a massive mistake to dismiss them as ‘proto-fascist’ or something. For one thing this would just be a bad move tactically - because any critic of Blue Labour advancing that argument is likely to be written off as someone making wild or ‘hysterical’ accusations. The danger is not that the Labour Party might morph into a quasi far-right party under the influence of Blue Labour, but that the Blue Labour narrative will poison mainstream political discourse (more than it is already) and help to create the sort of conditions in which very right wing parties and movements can flourish. It’s true, however, that focusing on ‘finance capital’ as something meaningfully distinct from productive or industrial capital is a mistake, both empirically and also in political-strategic terms. There is no hard and fast distinction anymore between industrial and finance capital (most major industrial capitals for example are also big financial players) and while it’s true that the City of London is massively powerful and that this has, historically, entailed major problems for the UK economy in terms of manufacturing productivity and ‘competitiveness’ and so on one has to regard the economy as, in a sense, an organic whole in which capitals and state institutions are closely intertwined rather than as a series of distinct sectors. To single out finance capital as the villain as Blue Labour do - and it’s really noticeable that in almost all Blue Labourite criticism of ‘marketisation’ and ‘commodification’ it’s finance and the City that’s the culprit rather than the logic of capital accumulation more broadly - is to let capitalism itself off the hook. So what Blue Labour are doing is making some apparently radical sounding noises about ‘commodification’ and so on, but channelling this criticism into an approach that is, in the end, decidedly unradical. They’re attacking a bogeyman figure and, in so doing, diverting people’s attention away from the real source of ‘commodification’ which is capitalism itself. The narrative seems to suggest that there’s a nice and caring kind of capitalism - based on manufacturing presumably - which is what we need to get back to, somehow, to relieve the various market based pressures and hardships suffered by working class people (longer working hours, indebtedness, rising unemployment and so on). And, yes, this could be a very nationalistic strategy. Would you say that this nod to nationalism is a departure from social democratic ideals? In a sense, social democracy has always been about the incorporation of the working class into national strategies of capital accumulation. There’s always been a nationalist, flag-waving and even jingoistic facet to it - or to a significant proportion of it anyway. But what’s different about Blue Labour is the sheer brazenness of the nationalism - the appeals to patriotism and the flag are right at the core of it - and also the racialised aspect to it, reflected in the invocation of the ‘white working class’. The other major difference about Blue Labour is the rejection of ‘the big state’ which, as I mentioned above, has to be seen in the context of the economic crisis and the austerity drive across the world. In my view, Blue Labour should be seen as a symptom of the ongoing (and sharpening) crisis of social democracy and labourism which has been rumbling on since the end of the post-war long boom sometime in the early 1970s. When the post-war social democratic Keynesian consensus fell apart parties like Labour found themselves totally disorientated as they realised that this consensus (which they had wrongly regarded as a more or less permanent settlement) had been completely dependent on peculiar and temporary post-war structural conditions of international capitalism. A lot of people on the left of Labour seem to believe that the party’s slow drift to the right was a wholly contingent process determined by the particular ideological views of various leaders which might, in principle, be reversed if only a left wing leader were to get his or her hands on the levers of power. What this overlooks, however, are the major structural blockages in the way of any return to full blooded social democracy presented by intense international capitalist competition today. In the long term, the sort of measures of amelioration that traditional social democrats advocate are simply incompatible with the logic of capital accumulation. We can’t just go back to the economic conditions of the 1950s and 1960s. They have gone forever. New Labour represented an enthusiastic embrace of these new conditions. Blue Labour, in a sense, takes this process of disillusioned adaptation further - it’s willing effectively to jettison the party’s commitment to the welfare state and to embrace a highly nationalistic strategy of capital accumulation. This is not to say that something like the Blue Labour approach is inevitable - it has to be resisted. But it is getting clearer and clearer that any serious struggle for the defence (let alone the extension) of social justice and humane economic conditions will run up against the structural limits of capitalism itself. This is something, unfortunately, that the Labour party is constitutionally incapable of doing.